I don't really print out web pages ever, but when I visit my parents, I see them print out Wikipedia pages and other informational web pages regularly. If you do print out web pages on a regular basis, you may know that it is possible to save printer ink and paper by optimizing content on the page before you send it to the printer. This can be done with readability extensions that turn the page into an optimized version directly, or with services that let you modify the print out before it is sent to the printer. Google Chrome users may soon be able to make use of such a feature directly in the Chrome browser. Currently available only in Chromium and Chrome Canary, it enables you to check an option in the print settings to turn the web page you are about to print in an optimized version. Update: Google seems to have removed the simplify print option in the Chrome browser. When you open the print dialog it is no longer displayed as an option. We suggest you use one of the readability extensions listed above for that purpose. The feature works very similar to readability extensions that optimize the look and feel of a web page you are viewing in the browser. Instead of doing that, Chrome's option is limited to optimizing page content in the print dialog. When you select the print option in Chrome, either with a quick tap on Ctrl-P or by selecting the option from the main toolbar menu or right-click context menu, you see the new "simplify page" option on the page listed next to the regular print options. The page is transformed automatically as soon as you select the "simplify page" option in the print settings. Chrome removes most elements from the page with the exception of core content such as text, select images or links. The layout of the page is often optimized in the process as well so that you end up with a compact version of it in the end. You will save printer ink and sometimes even paper in most occasions. There is no option currently to make the option permanent. Whenever you print, you need to enable it manually in the print options. 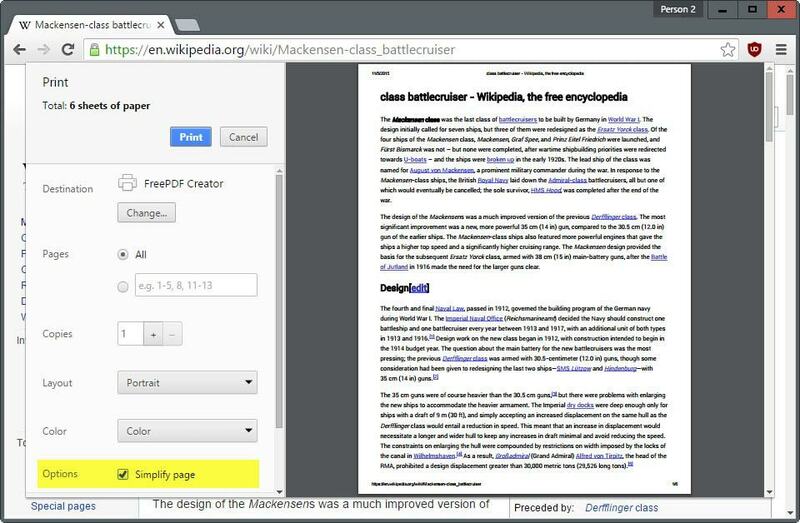 Chrome's new "simplify page" option improves printing in the browser. While that is a good thing, it is less flexible than third-party solutions that provide you with options to select elements to keep or remove from the print out. Since it is built-in on the other hand, it may become the preferred solution of Chrome users who don't want to install a third-party extension or bookmarklet to achieve a similar result. Now You: Do you print web pages? Google added a new option to Chrome's print dialog that allows you to print out a simplified page to optimize the print out and save printer ink and paper. It helps me to customize webpage as I like. Hi Martin, I have been using CleanPrint from www:formatdynamics.com for over a year. It is available in the Chrome Webstore extensions. If you access the FormatDynamics site (see above), you can download it for all versions of Firefox, Cyberfox, etc. CleanPrint really does save paper AND it will show and print all page content including graphics. Content which you do not want to print can be removed easily. Try it and don’t buy it because it’s free. Reference my comment above, you must be running the relevant browser e.g. Firefox, Cyberfox when you access the FormatDynamics site. The site will automatically recognise your browser and display the correct download for the browser. Sorry for the blooper ! Print to paper? …pretty much never. Print to a PDF–to “capture” the page info for later reference? …pretty much all the time. Ref Earl’s comment. I use CleanPrint to reduce the number of pages when I need to print an instruction manual doubke sided.. Try reading a 50 or 60 page PDF on screen without losing the will to live !!! I’m really glad to know about this! I rarely print sites, but when I am at work I need to print things and just need the basic information from them. as a result, I find myself using a stupid amount of paper and toner that I would *love* to avoid in the future… and I’m pretty sure if they were the ones paying for it they’d feel the same. “…it is possible to safe printer ink.” it should be save, right? Simplify page from the printing menu never loads. Very annoying. Me Too. Click on Simplify Page and Get Spinning Ball or Whatever, for 5 Minutes then Give up. What can we do to Fix? You are right, I just checked and the option is gone. I have updated the article to reflect that. Sad – it was a great help to my reference library. Google must have received too much pressure from advertising vendors or itself asking it to remove the feature. The official response is that “it wasn’t utilized enough” is bull. “Simplify page matters”, BRING IT BACK…………………. What happened to the simplify page option?!?!?! GRRRR! I just discovered and started utilizing it in August and now in September, it is gone. What gives, Google?! Whats the last version of chrome that had that option?